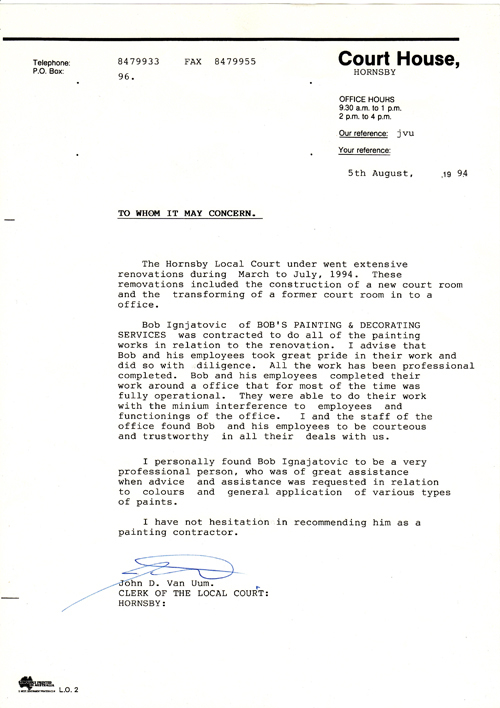 He worked on Telecom, Water Board, Court House, Banks P.C.C, Public Works and domestic jobs. I feel that any one that requires his services as a painting Contractor will not be disappointed. 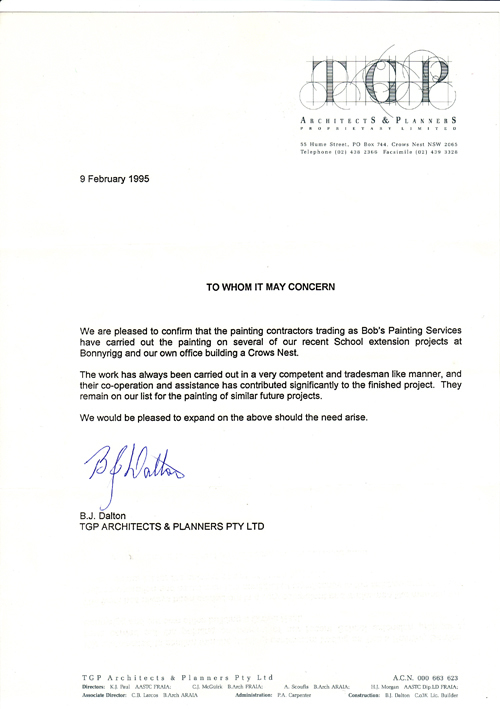 Tom Newby (Building Supervisor)	Avant Constructions Pty. 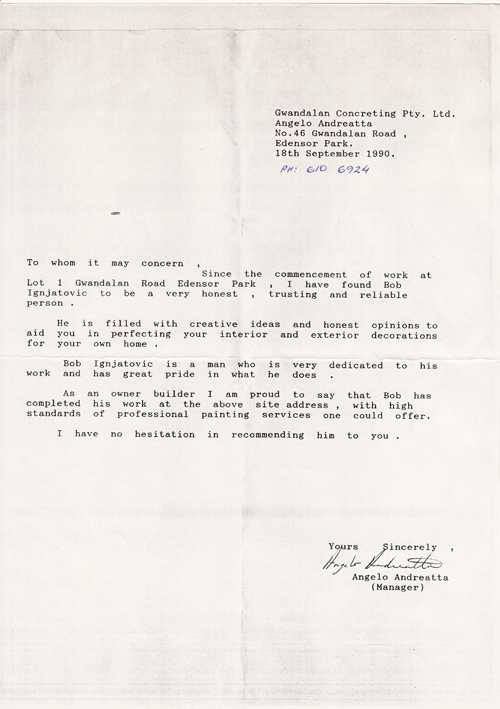 Ltd.
During that period I have found Bob Ignjatovic to be honest, reliable and a very hard worker. 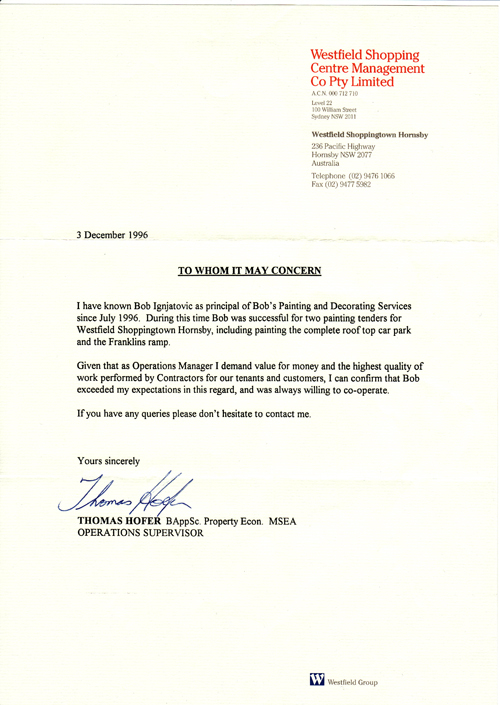 His preparation and paint application was of a high standard and I have no hesitation in recommending his workmanship. 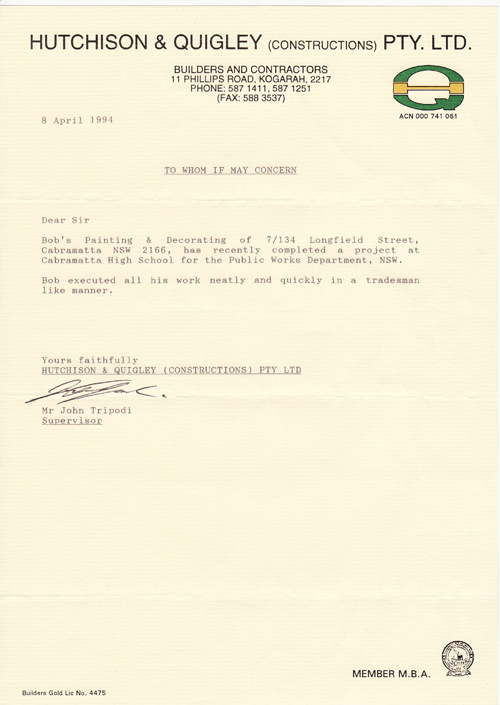 Throughout the period of renovations Bob's Painting & Decorating Company acted in a professional and courteous manner. Due to the standard of workmanship I would strongly recommend his professional services and would not hesitate in using his services in the future. David Anderson (State Manager)	Century Yussa Batteries Pty. Ltd. 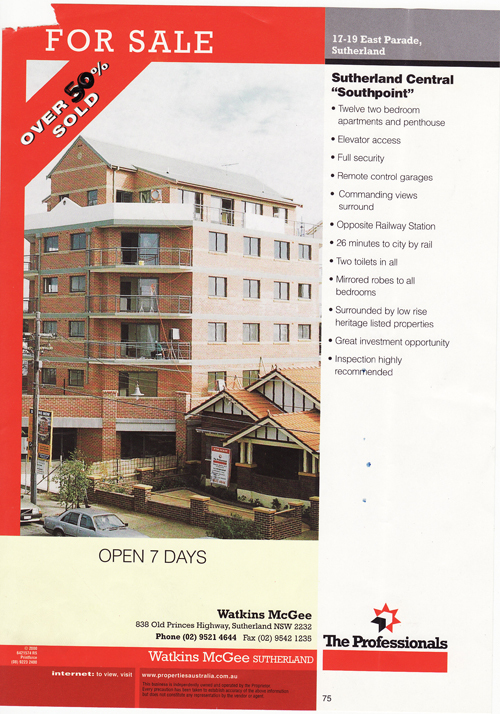 He has completed multipurpose hall, involving painting to timber, structural steel, masonry, wall and ceiling linings. 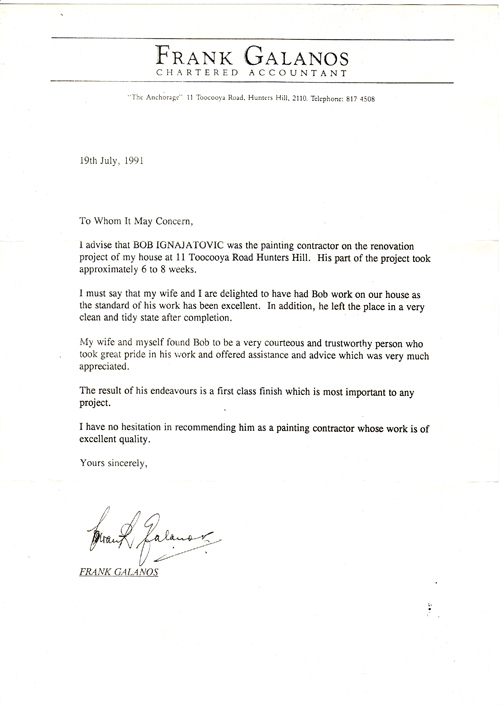 I would have no hesitation in using Bob's Painting on future projects. 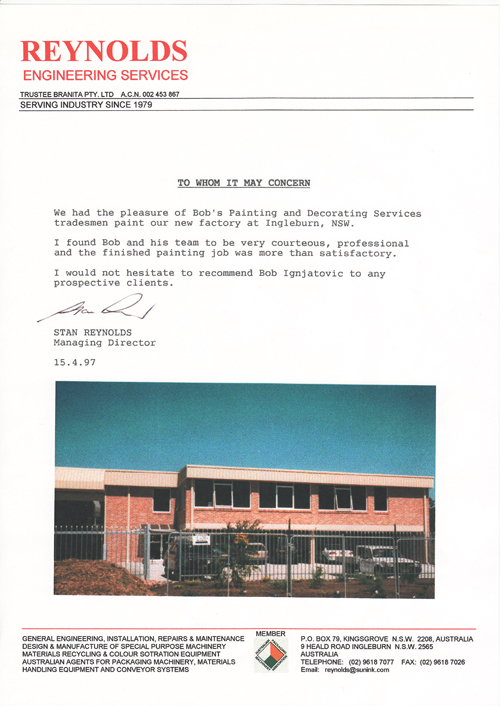 We had the pleasure of Bob's Painting and Decorating Services tradesmen paint our new factory at Ingleburn, NSW. 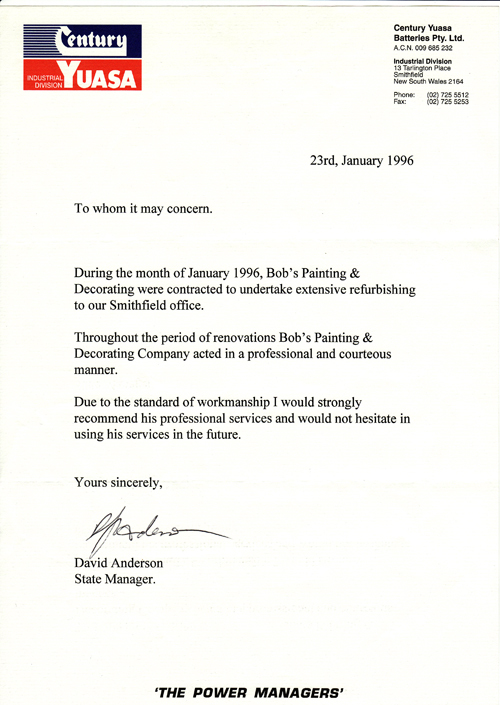 I found Bob and his team to be very courteous, professional and the finished painting job was more than satisfactory. 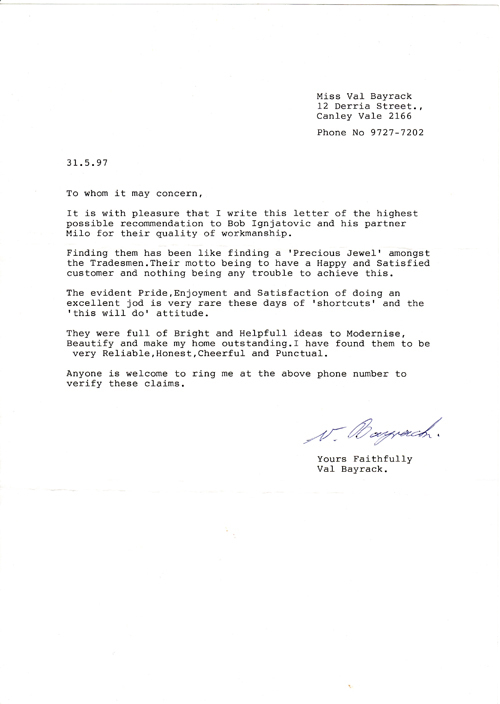 Stan Reynolds	Reynolds Engineering Services Pty. 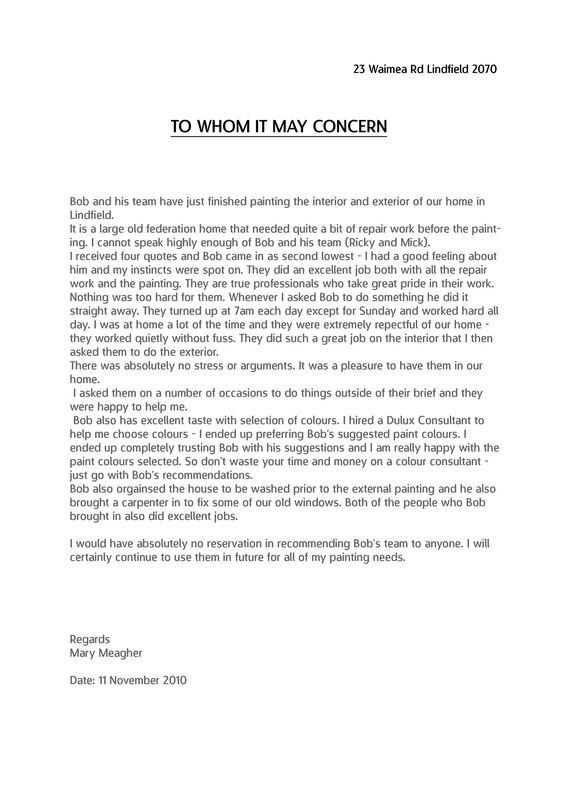 Ltd.
We engaged Bobs Painting and Decorating Services to paint the exterior of our two storey house. 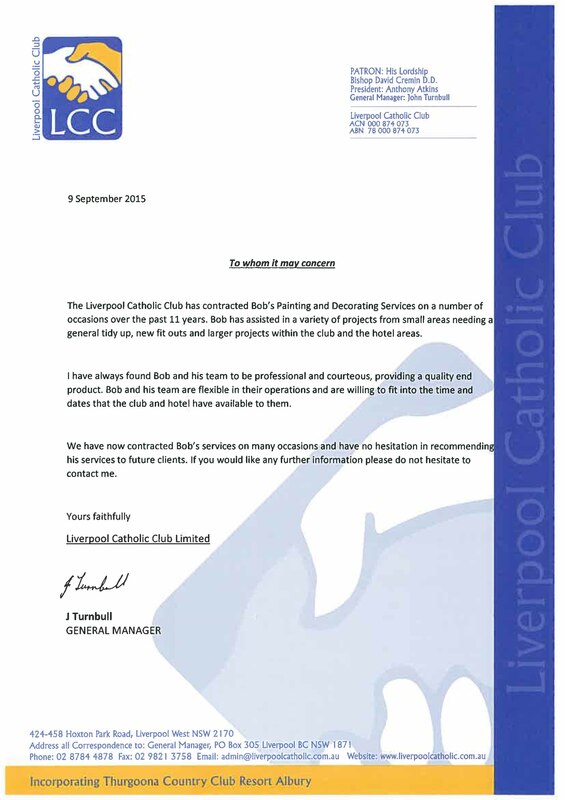 We were very pleased with all aspects of the work performed by Bob and his team. 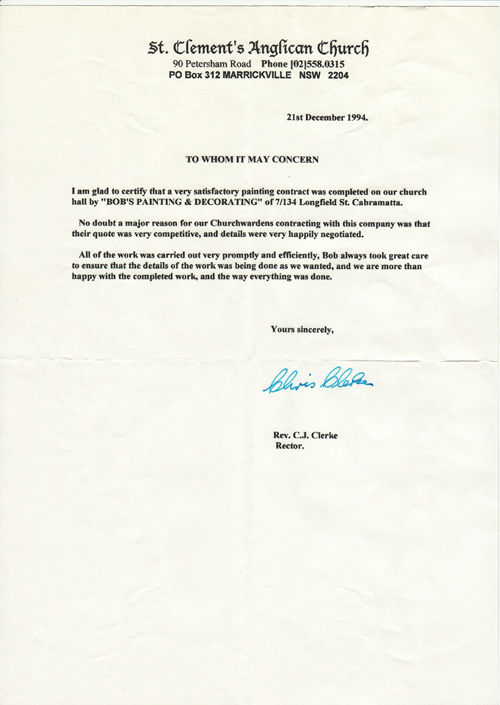 They were professional and courteous at all times. They were reliable and performed the job in a timely manner. They left the house clean and tidy at the end of each day. We are very happy with the end result and would be pleased to engage them for any future paint jobs at our house. 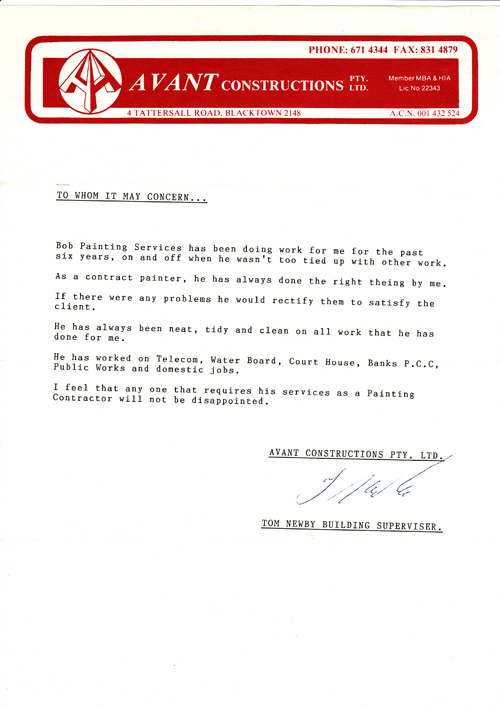 We have no hesitation in recommending Bobs Painting and Decorating Services. Bob also has excellent taste with selection of colours. 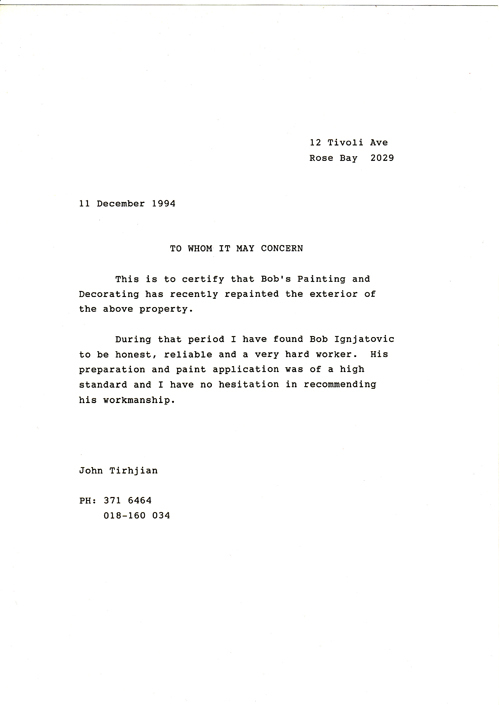 I hired a Dulux Consultant to help me choose colours - I ended up preferring Bob's suggested paint colours. I ended up completely trusting Bob with his suggestions and I am really happy with the paint colours selected. 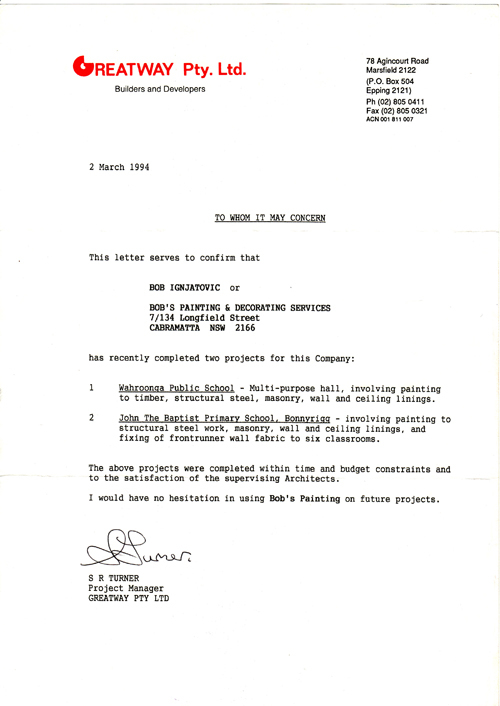 So don't waste your time and money on a colour consultant - just go with Bob's recommendations.